Michael Smit - How have you been an artist today? This project has been an ongoing, multi-year, meta-project of mine. It directly addresses accidental audiences at public sites as artists, asking them to consider how they have been an artist that day. The German artist Joseph Beuys (1921-1986) stated in the early nineteen seventies: "Everyone is an artist". I now hold the position that I not only enjoy the power of that statement but I also agree with it. This idea taps into the fundamental premise of the human condition and even holds the so needed way out of an accumulating man-made mess on the planet... What does it mean to be an artist? Over time many different and conflicting meanings of art have existed and still do. Over time I have developed an understanding of art that led me to believe that every human being, every day, has at least some experience of being involved in the fundamental act of art. And that, to me, is the act of creating something new and meaningful, through a creative back-and-forth process or dialogue, between one self and the surrounding world. I think this ability to make art, is an essential part of the human condition, a gift and a responsibility. I also think we can do better as artists than we generally do, and I suspect that we will have to, if we want to survive as a species. The thing that seems to break us humans up is that we don't seem to see or take seriously that everything is interconnected, that nothing can exist on its own, and that our success in life depends on our ability to create through real dialogue, to make meaningful new forms based on listening to both ourselves as well as our surroundings. To act that way is what happens in the making of good art. So yes I agree with Beuys, that everyone is an artist already (at times). And I'd like to test, investigate, and if valid encourage this idea's validity and relevance in and through my art. And the How have you been an artist today? project does this in a very explicit way. As someone who has worked as an art therapist in psychiatric institutions for years I am very familiar with hearing people say they are not creative. This is usually based on the conclusion they miss the skills needed for art, and the assumption that creative people are those exceptional geniuses with unique and rare gifts, specialists that amaze us with their abilities in fields like painting, dancing, writing, singing etc, the Arts. Fields with languages and histories that often seem to require quite an introduction through education and upbringing to become comfortable with. To my surprise I learned through experience that many of the self-declared non-creative people actually were able to create interesting and sometimes even amazing art work once they allowed themselves to engage. I want to go further than that however. As I see it art is not limited to the work by artists-specialists nor to those specific 'artistic' activities involving paint, pen, music, dance, etc. This project seeks to further investigate and explore this possibility of art, in dialogue with an inclusive audience. It of course puts to question what art is or can be and how it is or can be relevant in the wider picture for everyone, beyond the realm of the so called art world. Even if it's now thirty-plus years after Beuys' famous declaration. There have been a number of versions of this project, and although this work tends to be inserted and performed at public sites, there have been several overlappings with exhibition spaces. Various stages and versions of this project were and still are presented at different places and times in the United States. An invitiation to inclusive and often accidental audiences at public sites, to consider how they have been an artist today? A public intervention that addresses the relevance, possibilities, and meaning of art. The project started as a site-specific installation on my graduate study studio's windows. The initial challenge to myself had been to create a site-specific work in my studio that would be a statement about my interest in public interventions. The site was a beautiful one: my great painting studio at the MFA program at Mills College in Oakland. It had one wall that was all windows up from the waiste; it had lots of light. In the past it had been the printmaking studio but that program had been terminated and the space had been spiltted into two graduate studios. The perfect place for someone like me with a BFA in printmaking and that was accepted in the program on the basis of my painting slides (I was advised at an exploratory faculty consultation to make my portfolio the clearest and strongest by only including my paintings and not the documentation of public projects; after admittance I would be encouraged to develop into any direction I needed to go, and so it went... I knew my interest was in public interventionist projects). Since my undergraduate printmaking days, or since my youth actually, I have always been intreagued and inspired by windows, by light and dark, and (in)transparency. So naturally I was intreagued by the large party of windows and all that light in my studio. I wanted to make works for, on, and with it. My thinking about art as a subject (and vehicle of meaning and change) had led me also to artist Bruce Nauman's work, whose early "Mapping the Studio" videos I always had liked. I found a depiction of an earlier 1966 work though that was hung in his then San Francisco studio in front of his studio window, like a site specific work with text that was facing the street. In the photo you could vaguely see traces from the outside world, it seemed a third or fourth floor window, and it was possibly not really readable from the street. On a piece of rosa colored mylar it said along the edges of the rectanglular piece of plastic: "The True Artist is an Amazing Luminous Fountain." Of course it fascinated me formally and contextually, and it became one station on this journey to my own 2004 studio and practice specific statement and work, that I'm talking about here. Nauman later used this sentence in several exhibition installations and other works. An even more important such station for has been Joseph Beuys' work and practice and specifically his early nineteen seventies statement "Everyone is an artist" ("Jeder Mensch ist ein Künstler"). It was important for me to use a statement that at the same time was an invitation for participation and exploration by others, in a dialogue. The text should be experienced as a starting point, for the rest of the work. It should be activated not only by me, and the location, but certainly also by the audience. The work had to be 'completed' by its users and that would include myself. As it was situated on a wonderful transparent window area it gave me the opportunity to work with both light, and surface. The text "How have you been an artist today?" was carefully hand painted by me and my wife over a large set of glass panes of my beautiful painting studio at Mills College. I had first created several mockup versions of the text installed on the windows on my computer and I had printed out a few to try them out for the composition, and the best one I then used as a guide. A matte, semi-transparent and slightly rosa-tinted acrylic paint was used. The painting had a fairly subtle visual presence. It was noticeable for the good observer (when walking by it reflected more light under certain angles ) but not extremely eye-catching. I wanted the work to be discovered, so that noticing it could be experienced as an acquired reward, resulting from an active relationship with the surrounding world. I imagined this project's starting question as an invitation to inclusive audiences to use ones creative power in the relation, to at least for a moment consider what the practical relevance of art has been, is, and could be in his or her individual daily life. Site-specific studio-window painting, installation, and intervention. The text "How have you been an artist today?" was painted along my beautiful studio windows by me and with the help of my wife. It was applied on the glass with a matte, rosa-tinted, and semi-transparent acrylic painting medium. The text was faced toward best readable from the outside. For a second version of this project later in 2004 I designed a response card and had an edition of 2,000 copies printed. I wanted to take the project further and build in more of the qualities that are essential to art for me: relation and dialogue. This time I wanted to more directly investigate, with the audience, whether and how art really is or could be a relevant part of anyone's life. On the upper part of the front of each card was only the question How have you been an artist today? printed, with plenty of open space for a response. On the back some further information and the possibility to sign up for email updates about the project were given, and a return address. Most of the cards were personally handed out to random people that I set out to encounter on streets and public sites in Oakland, Berkeley, Emeryville, and San Francisco. At these occasions I often could give further information about the project and it was not unusual to immediately get lively responses or get involved in a dialogue, before they even accepted and took with them a card, to possibly return later by mail. I remember one of my days on the street in San Francisco, the day after the second presidential re-election of George Bush in 2004, when many of the people I talked to seemed in shock, dazed or depressed, wondering what to do now with their life, now the undesired had happened (again). It turned out to be a great moment actually, to remind through my project of 'the creating in the relating' that we (can) do every day. I also experimented a bit with other ways of distributing the cards. I got permission for instance to put my (free) cards in an empty Hallmark-like card rack in a neighborhood pharmacy in Oakland, and likewise at a bar next to other piles with flyers etc. I also tried placing the cards, guerilla style, in places like the empty slots of a post office rack. Sometimes people requested a bunch of cards so they themselves could distribute them to others which was great. In the end I preferred the road of more direct one on one interactions, as they felt most effective for me personally. At times I just handed out cards to people I saw, at other times I also got to explain the general ideas behind this investigation, and through either way I did regularly get some immediate verbal responses that led to further conversations. At times the engaging in these uninvited and indiscriminatory exchanges did make me feel a bit like a weird mix of Jehova witness, campaigning politician, researcher, and guerilla performance artist. As I went on I learned what was respectful and effective and what not. I sought out different public areas and groups of people, to make it as inclusive an audience as I could. About 150 cards were eventually returned and at a few occasions they were displayed and shared, but always accompanied with the invitation to the audience to personally and actively contribute by responding to the question and returning the card. Over time it became clear to me however, that the mailed-in responses tended to be less adventurous and were kept more safe than they had been in person, during the direct interactions that I had had on the street. This is not so strange actually. Once you're asked to put something 'on black and white' and send that in, people might feel more like they are taping their own performance and oviously can become more self-conscious and judgmental. Design of a response postcard, and a offset printed first edition of 2,000. Most cards were personally handed out in public spaces, often followed by related conversation. About 150 cards were mailed back to me. These have been archived and are shown occasionally, in different ways. For the next manifestation of the project I therefore decided to make the conversational form its medium and skip the return postcard format altogether. This made especially sense as to me art basically is about the creation of meaning through connecting in dialogue. To document the process, and to make accessible the contents of these dialogues for possible further research and sharing, the audio of the conversations were recorded. I chose for audio only, and not video, to keep the procedure as simple and unobtrusive as possible, so everyone involved --including the instigator-- could focus on participating in the meeting and conversation making. I also made sure at least some photos were taken to later also be able give a visual sense of the process. Even so, to me the core of this work was, and still is, is what happens in each process of live interaction between the person who suggested and initiated it, and the participant who agreed to sit together and consider this question. I make an effort to make it as much as possible a dialogue, meaning I'm not the only one that can ask questions, and I can also respond to the other person's responses. It's not an interview necessarily (it can turn out to become one) but rather a joint effort to investigate if there's any validity to have been an artist that day? And to see what artmaking means. And for me to investigate my own ideas about all this and hopefully it leads for both hopefully learn and develop in the process. I quickly noticed that most people I addressed and invited to participate as a conversational partner were willing to give the subject some time and consideration. Because it is a two-sided investigation, involving a dialogue between two people, as opposed to just taking down answers or observations as in a scientific laboratory or marketing research situation, the resulting conversations often had a surprisingly intimate quality. It seems people really like to share, even with strangers, what was important to them that day. Both the project volunteers (see below) and myself have felt unexpectedly energized by these interactions. As this project is about the possibility of everyone indeed being an artist I decided to make the execution of the work less centered around me, as the only person who could or was aloud to perform and instigate this work. The more others are involved and participating the more effective it can be. Just as with theatre, music and other time-based live performances it can be executed by others. So I started to train volunteers to engage in the same practice. 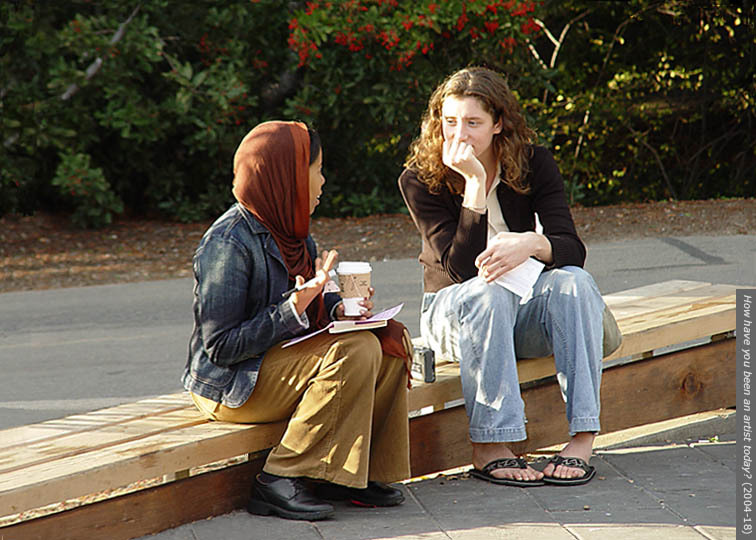 In 2005 a group of volunteers and I have instigated dialogues at various public sites in the San Francisco Bay Area; mostly in Oakland, San Francisco, Berkeley, and Emeryville. Although the majority of the conversation were with people we encountered by chance, occasionally specific others were engaged in a pre-arranged meeting, people we knew or were specifically interested in, to engage with in this investigation. Site-specific studio-window painting, installation, and intervention. The text "How have you been an artist today?" was painted along my beautiful studio windows by me and with the help of my wife. It was applied on the glass with a matte, rosa-tinted, and semi-transparent acrylic painting medium. The text was faced toward and best readable from the outside. For my 2005 MFA show at the grand Mills College Art Museum I for the first time presented this project in such an art world context, as opposed to public places outside. Initially this felt somewhat problematic. I've always stressed my interest in working with inclusive audiences and inclusive sites and that's one reason I focus on working at these accessible types of outside public sites. However, as I want to be inclusive, I can't exclude art world locations of course. They can also help the project by giving attention to it with a certain angle, and they get the favor returned by this project making art more relevant in the greater environment. Most of all the How have you been an artist today? project is about the power of art, and this of course makes it as much at home in a museum or gallery, if not more, than anywhere else. Whenever How have you been an artist today? is presented at such a specialized art space it is important to me to extend its existence and relevance as much as possible beyond the temporary gallery presentation; so people will understand that it belongs not just there. For that reason its presentation also requires live activation and participation, so it can actively be experienced and co-created by the art site audience. Ideally these presentations are also combined with simultaneous dialogues in the art site's greater public environment outside. For the Mills College Art Museum show I built an architectural installation that suggested a multi-functional room (mixing gallery, archive, office, cafe, performance, and studio aspects), as temporary project headquarters, to contrast it to the grand architecture and to the more traditionally presented works (photography, painting, sculpture, and video) by others. I was present for the whole duration of the show, to continue the work and had many dialogues during the show. A volunteer was also actively instigating and recording project dialogues outside, during the opening. An architectural installation and semi-room built and inserted in the main gallery of the museum as temporary project headquarters. The hybrid space combined a mix of archive, gallery, cafe, office, studio, and performance space functions. During the show I was permanently present to invite participation and activate the work with visiting visitors. Many new dialogues were created, performed, and (audio) recorded. Because of the increasingly ubiquitous presence of digital technology in the world I gave up my initially strong resistance to it in 1996, and I subsequently made it one of my missions to explore it further as a possible artists medium and tool around the time time we moved to the Silicon Valley area from Amsterdam. In fact that was one reason I was interested in going. Only after the intensity of this exploratory project had slowed down, and I had learned and taught digital artmaking skills, and understood better what the technology made possible and was about, I discovered the online virtual world of Second Life, late in 2005. At this point computers had become a regular part of my day to send and receive emails, and to visit the internet. So the step to communicating and collaborating with others, while represented by a customizable and and moveable 3D graphical avatar, in an online 3D virtual landscape where you can move through and build your own environment and objects, was not that big as it only a few years before would have seen. Just as in the 'real' world there is such a thing as public space in the online virtual world of Second Life. There are some differences however, beyond the obvious difference between physical reality and virtual appearances. The whole virtual Second Life simulated universe itself exists on the servers of a company called Linden Lab, which has its headquarters in San Francisco; and so it really all is the realm of a commercial enterprise. Nevertheless, it is possible to have a free account and that makes it fairly publicly accessible, if you have a powerful enough computer and broadband internet access. So I started to do the same How have you been an artist today? practice there. With the difference that this time the people share the same virtual space but could be behind a computer anywhere on the world. In Second Life I had a one man show at the Ars Virtua Gallery and New Media Center, a virtual art space associated with the CADRE laboratory for new media in San Jose, California. It was one of the two inaugeral shows, in May 2006. In this show I presented a series of documentory images, in a life-size scale, screenshots and photos of dialogues in process at publc sites in Second Life as well as in the analog world. The images were presented as three dimensional objects or panels in space that were standing on the floor that one could walk upto, and interactively engage with. Clicking on these panels in the virtual gallery exhibition space would give you a text document with an abstract as well a complete transcript of that particular conversation and that you could choose to keep. As always my work was presented as something that needed to be experienced and participated in to be fully experienced, so there were live dialogues offered and performed with visitors in the space (as well as outside with accidental audiences in the virtual landscape of Second Life). Also, in accordance to my interest in making art a part of the everyday and everywhere context, the interactive panels were also on display, billboard-style, on different locations in the virtual Second Life landscape. A next presentation of the How have you been an artist today? project within Second Life was in the context of a group show called Sudo Island, an exhibition "combines virtual and physical works made by twenty-three selected artists exploring the internet-based virtual world Second Life". It had a (still ongoing) virtual presence in Second Life and simultaneously physically existed at exhibition spaces in Seattle (Pixel Dolls, Meat Space, And Everything All At Once; Seattle Center, Sept 1-4, 2006) and Miami (Sudo Island Project Room, Aqua Art Miami, Dec. 6-10, 2006). Through large projection screens and computer terminals visitors in Seattle were able to follow and participate in dialogues performed live. In Miami this live participatory aspect unfortunately had to be excluded due to last minute technical problems but a few documents were on display. Based on How have you been an artist today? I have on occasion experimented with a hybrid of lecture / workshop / performance that allowed me to address some of the interests behind the project while addressing groups. Also in Second Life, the first time having taken place on October 28, 2007, at another virtual art space called the Gaori Community Art Gallery.